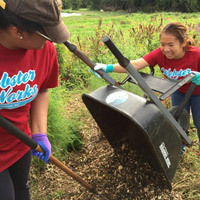 The annual Webster Works Worldwide annual community service day is set for Oct. 7. Webster Works Worldwide (WWW), the annual community service day, is just around the corner on Wednesday, Oct. 7. Since the start of WWW in 1995, over 30,000 volunteers have given more than 128,000 hours of service! We hope you will join us in this very important Webster tradition again this year. A special Webster Works Worldwide opening event is planned for 8 a.m. in Grant Gym on Wednesday, Oct. 7. Mark you calendar for "A Send Off to Fuel your Mind, Body and Spirit" prior to the day's activities. We will hear some inspirational words, enjoy breakfast together and distribute WWW t-shirts. UPDATE, Sept. 2: The St. Louis project database is now open for volunteer registration. Volunteers can select projects or sign up for reserved activities as assigned by their class or organization. Visit the project database to register and search for projects. Be sure to pay attention to project times and locations. Please visit the project database to look at the projects offered this year. Once you are registered, you will show up as the Team Leader on the project page. You will receive additional information via email. If you would also like to reserve the project for your group you may do so during your Team Leader registration. After selecting the "Reserve this project" box, you will be asked to enter your group's name. Please keep in mind the number of volunteers requested for each project. The project you choose must be compatible with the number of volunteers in your group. For more information about the event visit the Webster Works Worldwide site. The WWW Planning Committee greatly appreciates your participation and support in this annual community event!